Big week for mapping news. Google's got a bunch of new stuff, like offline maps. Apple's got its own maps now too. 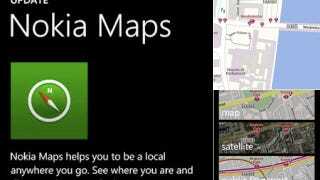 And Microsoft is reportedly making the switch from Bing to Nokia's maps for all phones in Windows Phone 8. Awesome. The report, from WPCentral, follows similar stories that Nokia would be the default app, but it makes sense to just rename it Maps and eliminate any confusion. The switch would also bring in Nokia's 3D navigation, and transit directions. That transit info is especially juicy, since it's actually more detailed than Google's in some ways, and Apple doesn't have any first party transit info—it's sourcing it out to third parties.